Whatcha Got Cookin’ at Kitchens by Clay? 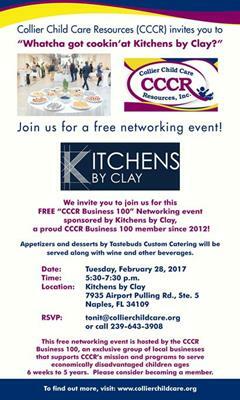 Members of Collier Child Care Resources’ “CCCR Business 100” will host a free networking event, “Whatcha Got Cookin’ at Kitchens by Clay?” on Tuesday, February 28, 2017 from 5:30-7:30 p.m. at Kitchens by Clay, located at 7935 Airport Pulling Rd. Ste. 5 in Naples. A member of the CCCR Business 100 since 2012, Kitchens by Clay will sponsor the event in their newly expanded showroom where appetizers prepared by Tastebuds Custom Catering, wine and a variety of other beverages will be offered. Admission is free. Please RSVP to Tonit@collierchildcare.org or call 239-643-3908. Collier Child Care Resources (CCCR) operates four early learning centers in Collier County. The four centers include Child’s Path for children ages two to five and Little Wonders for children ages one to five. CCCR also operates A Step Up Child Development Centers located at Golden Gate and Immokalee High Schools, for children ages birth to five years, of teen parents who wish to continue their high school education. To learn more about Collier Child Care Resources (CCCR), volunteer, or make a donation, visit www.collierchildcare.org or call 239-643-3908.